The Birdie Ball Super Target Set includes 12 Birdie Balls, a 12 inch diameter target with pole flag, and a strike pad. Also a Carry Duffel is included. It is great Fun and a terrific way to practice golf and play games with your friends. BirdieBall® is the best golf training aid invented this century! 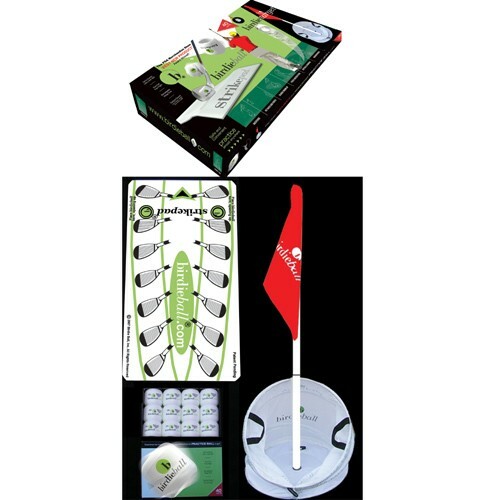 The Birdie Ball Super Target Set includes 12 Birdie Balls, a 12 inch diameter target with pole flag, and a strike pad. Also a Carry Duffel is included. It is great Fun and a terrific way to practice golf and play games with your friends. BirdieBall® is the best golf training aid invented this century! That's a bold statement, but golf coaches and PGA golf instructors around the world agree, and have voted it the PGA, Product of the Year in Orlando! It is a limited flight practice golf ball without limited feel. True feel with a long hang time, golf ball-like, trajectory! But it only flies 40 yards, so you have your own backyard driving range. Take a full swing. Draw it Fade it. Grab a buddy, get 40 yards apart and hit them back and forth. You wont believe the turbine sound created by the high rate of reverse spin. It's very durable, in fact Pro Series Birdie Balls won’t break like perforated practice balls or wiffleballs.